Down Home Radio Show and The Fabulous Jalopy Theatre announce the 4th Annual Brooklyn Folk Festival taking place Friday, May 18th through Sunday, May 20th in Brooklyn, NY. The 3-day festival includes 30+ bands, vocal and instrumental workshops, a family-friendly square dance, film screenings and as well as the return (in a new form) of the much loved “Banjo Toss” competition of 2011! The Brooklyn Folk Festival will feature the best in old-time string-band music, folk, blues, song writers, bluegrass, Klezmer, Caribbean and Balkan folk music, songwriters and much more! 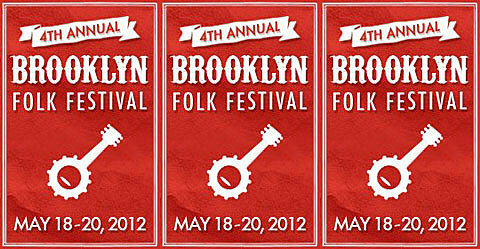 The Brooklyn Folk Fest is this weekend, happening Friday – Sunday (May 18 – 20) at 354 Jay St. in Downtown Brooklyn, with after-parties at the Jalopy Tavern in Red Hook. Tickets are $20 a day or $45 for weekend pass, and are still available. The lineup, which is pretty similar to last year’s, includes Feral Foster, Peter Stampfel, The Whiskey Spitters, Blind Boy Paxton, East River Sting Band and more. 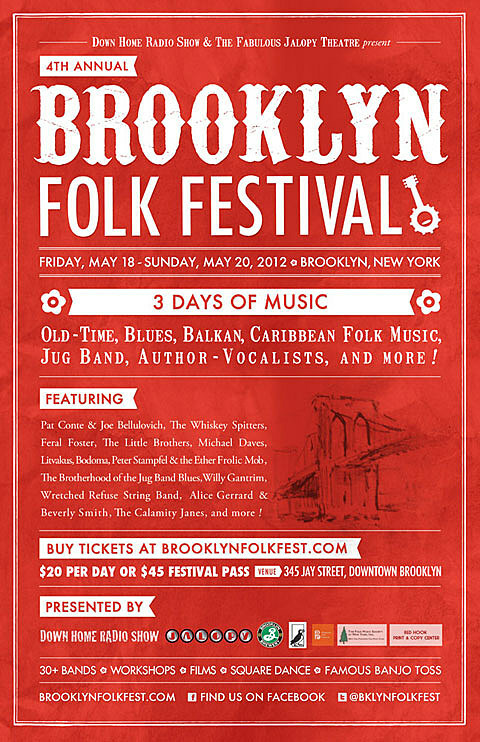 Visit the Brooklyn Folk Festival website for more info, and check out the three day schedule and flyer below. 12:30PM – 2:00PM KIDS: Jarana Beat Family Concert Kids under 14 are free!